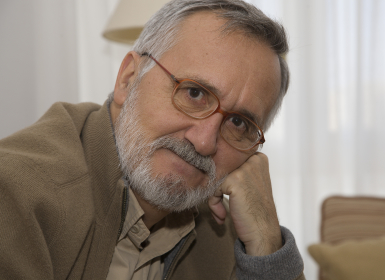 Xavier Alcalá is one of Galicia’s most established writers. He has published over twenty works of fiction in the last thirty years. Themes in his work include emigration and the Spanish Civil War. Most recently he has published the trilogy Evangelical Memory, an extremely well documented account of the experiences of the Evangelical communities in Galicia during the twentieth century. Other well known novels include Our Ashes and Fable. He has written widely about his travels in Latin America and been a regular contributor to Galician newspapers since the 1970s. He is a trained telecommunications engineer with a PhD in computer science and lives and works in Brussels. The novel Between Frontiers (348 pages) is the first book in the trilogy Evangelical Memory dealing with the experiences of the Evangelical communities in Galicia from the reign of Alfonso XIII (1886-1931) to the death of Franco in 1975. Between Frontiers goes as far as the Spanish Civil War; the second book, In the Catacombs, deals with the postwar; and the third book, A False Light, with the time of Franco’s dictatorship. Thou shalt surely die, yes. I have spent years considering the form of a declaration, a story that reveals the substance of my own life and the life of those who advanced alongside me against the current, against the faith, incorrectly in the eyes of others. I have been delaying the effort of pen and paper, photographs and documents, memories that bring to life past anxieties, and have done so out of a sense of modesty rather than shame. We believers have nothing to hide in front of men, even less so in front of our Creator, who would have us be free in spite of the original sin we took part in. I modestly observed silence whilst accusing myself of tempting God with the inactivity of a hand that remains steady, apt for fulfilling the tasks of a profession I learned with pride. I was tempting God because he could bring my hours to an end at any moment. Every human realizes when he has reached the point in his existence at which each new dawn is a divine present. This is why I say I tempted, and continue to tempt, God because I do not know if I will have sufficient days and strength to carry out the task before me. In short, I ask the Almighty to forgive my negligence and deliver me from the mistake of a chronicle written hastily for fear of not revealing what has to be revealed.